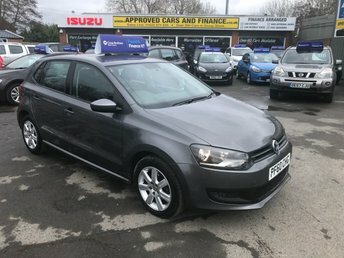 APPROVED CARS ARE PLEASED TO OFFER THIS VOLKSWAGEN POLO 1.4 SE DSG 5d AUTOMATIC 85 BHP IN METALLIC GREY IN IMMACULATE CONDITION WITH A GOOD SPEC INCLUDING ALLOYS,AIR CON AND MUCH MORE WITH A FULL SERVICE HISTORY, IDEAL FIRST TIME CAR LOW MILEAGE AND LOW INSURANCE AND TAX. APPROVED CARS AND FINANCE ARE PLEASED TO OFFER THIS VOLKSWAGEN POLO 1.4 SE 3 DOOR 85 BHP IN PEARLESCENT WHITE WITH A FULL SERVICE HISTORY WITH A GOOD SPEC BLUETOOTH, AIR CON AND ALLOYS WHEELS. PERFECT FIRST DRIVER CAR AND LOW MILEAGE FOR THE AGE OF THE VEHICLE. Compact and stylish, the Volkswagen Polo is a supermini on a mission. With a solid heritage and grown-up personality, it manages to offer just the right mix of performance, practicality, style and efficiency. Come and take a close look at the latest used Volkswagen Polo models for sale in East Peckham at Approved Cars Ltd (Approved Cars Izusu). Arrange a test drive and you'll get the chance to discover just how much fun you can have behind the wheel. Come to Approved Cars Ltd (Approved Cars Izusu) and you'll not only receive a warm welcome, but a member of the showroom team will be on hand to guide you through the full range of used cars available.